Spring is in the air and Easter is around the corner. This card is vibrant and delicate in appearance. The bright colors in combination with the parchment paper are a great pair. Start with a white card base of 5 1/2 x 7 1/2. Layer a piece of mint card stock that measures 5 3/8 x 7 3/8. I used a 5 x 7 piece of kaleidoscope paper that is part of the Razzle Dazzle Paper Pack from Michaels. I embossed the paper with Swiss Dots by Cricut. I attached a piece of pink ribbon to the center and attached to the back. Layer the kaleidoscope paper onto the mint card stock. For the center of the card, I used the Labels 49 die by Spellbinders. I cut the largest die in yellow card stock, the second largest die in white and a frame with the same 2 dies in mint card stock. Stamp Happy Easter with black Staz On the white label. The Happy Easter sentiment is from the Happy Spring stamp set by Rubber Cafe. For the flowers, I stamped the Flowering Dogwood flowers by Heartfelt Creations onto parchment paper using Victorian Velvet Distress Ink by Ranger. I stamped two sets of leaves. One is on regular white card stock with Forest Moss Distress Ink and the other with Cracked Pistacio Distress Ink on parchment paper. The stamens are die cut out of parchment paper and moss card stock. To shape the flowers, I used a bone folder to curl the petals and then used the Flower Shaping Tool by Heartfelt Creations to push down the center of the flower. I added two stamens to the center of each flower. I combined 1 moss card stock stamen with 1 parchment stamen. To assemble the card, layer the white label onto the yellow label. Use pop dots to layer the frame on top of the yellow label. I used craft foam on the back of the label to give dimension to the center of the card. To decorate the label, I attached 2 of the Dogwood Flowers to the left corner and 1 to the top right corner. I embellished with both types of the leaves, Arianna Lace pieces, a pink bow and pink pearls. During this season, I hope you are generous with your talents. I wanted to keep the front of this journal simple. I found a great leaf paper in The Mixed Media Paper Collection by Recollections. I cut out some extra branches to add extra depth. For the cherry blossoms, I used a pale pink card stock and my Mini Floret Dies from Heartfelt Creations. I crumpled the smallest Floret for the buds. 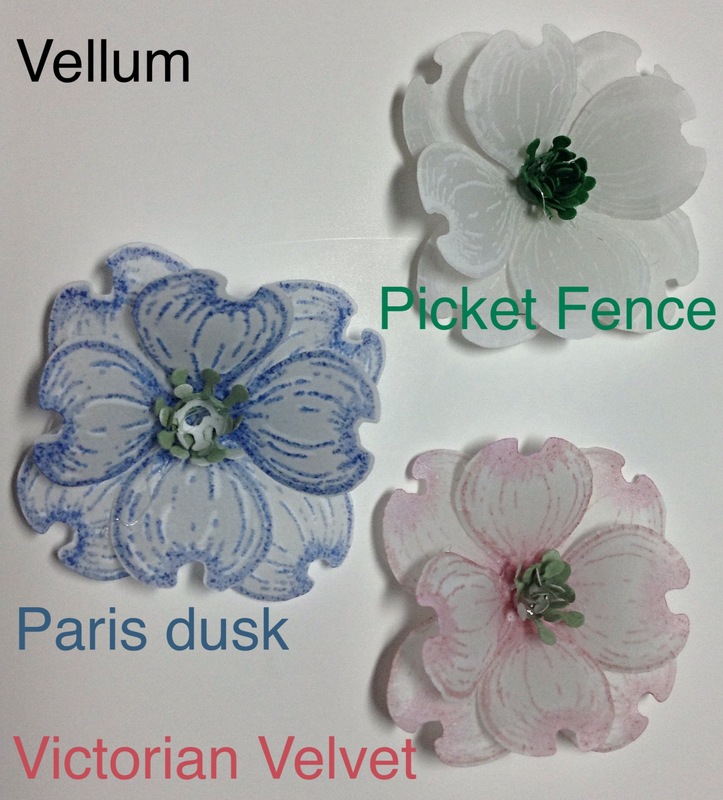 For the open flowers, I used a 2mm Flower Shaper and only shaped the front edge of each petal. The stamens are done with white card stock and inked with a Bubblegum pink. For the leaves, I used the Open Leaf Die by Heartfelt Creations on a darker pink paper. I used a quilling tool to shape the leaves. To finish off the journal, I layered pink seed beads with pearls on pins and inserted them between the flowers. As always, share your creativity with others. Instead of giving up something in the Easter season, I try to do things for others. Our military provides us with our daily freedoms and I wanted to find a way to say “Thank You”. I have a friend and her brother is serving in Afghanistan. He is her only family and he is so far away. This trifold card starts with a 6 x 12 base that is scored at 4″ and 9″. Fold the score lines. I chose panels to fit each side of the card. I chose a panel for the middle that has space to write a special message. The right inside panel I made into a pocket to hold tags that can either have a special written message or a photo. As always, pay forward in life. Share your creativity to help someone else have a better day. This card features the Celebrate The Journey Collection by Heartfelt Creations. I made this card to inspire those going through a tough time in their life. If you think of everything as a new adventure, your positive outlook will get you through. This card starts off with a blue base that is 5 1/2 x 7 1/2. I used a white panel that measures 5 3/8 x 7 3/8 embossed with “Clouds” by Embossalicious. I accented the panel with Broken China Distress Ink by Ranger. The panel is from the Celebrate The Journey Paper Collection. I cut out the middle panel next to the balloon to allow the clouds to be seen. I used pop dots to lift the panel. To accent the balloon, I cut out a Fleur Border Basics from the turquoise paper in the pack and cut down the arches. I used the tags and border papers to finish off the card. If you know someone going through a rough period, do a little something to encourage them. It’s easier to stay positive in life when you feel supported. Sharing your cards will give them something positive to look at every day. This pastel “Happy Spring” card will brighten anyone’s day. The base of this card is a 6″ x 12″ white card stock. Score long side at 4″ and 8″. Fold score lines. Chose a design for the panels. I chose the mini scallops and the perforation designs from the Classic Border Basics by Heartfelt Creations. I cut the panels at roughly 1/3 from the bottom and 2/3 from the bottom. Cut the matching lilac panels using the left and right edges from the Classic Border Basics. I ran the panels through my Cuttlebug using the Swiss Dots folder by Cuttlebug. Attach the panels to the card. My inside back panel is a piece of white card stock embossed with the Darice Rainbow Frame and layered on the lilac card stock. 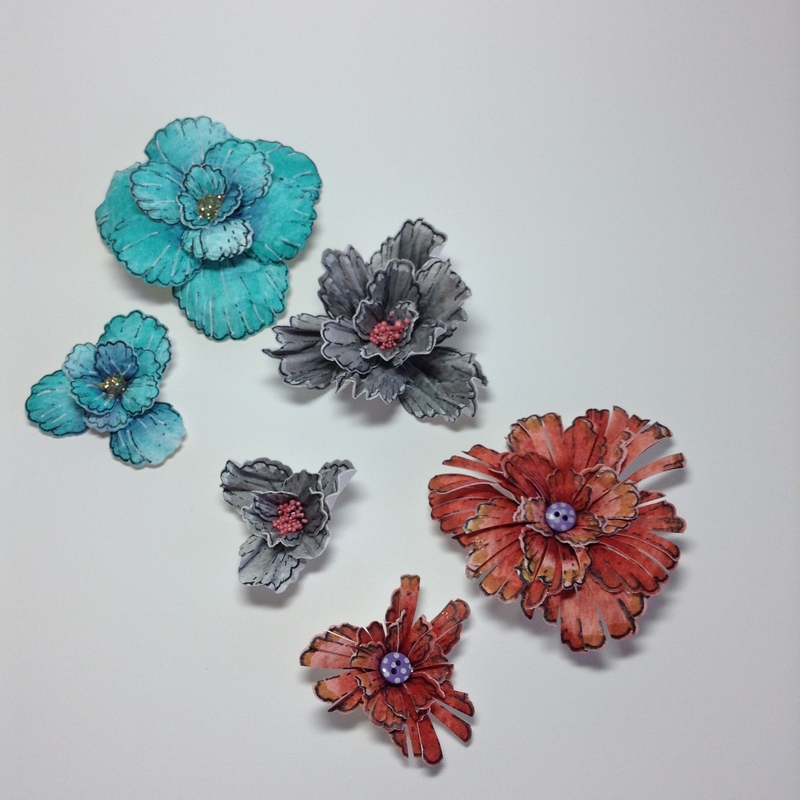 For my flowers, I stamped the Flowering Dogwood by Heartfelt Creations using Dusty Concord Distress Ink by Ranger. I accented the flowers using a lilac colored pencil , shaped them and centered them with light green seed beads. For my leaves I took apiece of white card stock and used Bundled Sage Distress Ink and Frayed Burlap Distress ink by Ranger. I stamped the Flowering Dogwood leaves in Forest Moss Distress Ink and then die cut them. My sentiments are from the Happy Spring Collection by the Rubber Cafe. I stamped both on white card stock with Dusty Concord Distress Ink and used my Label 56 by Spellbinders. I left the die cut around the “Happy Spring” sentiment and lightly applied the Victorian Velvet Distress Ink. I finished the card with some accent pearls and Say It With Pearls by Want to Scrap. As always, thank you for visiting. I hope you make this card and share it with someone who needs a little Spring in their life. For me, making flowers is relaxing. It’s a great way to unwind at the end of the workday. I love to try and make different styles of flowers from the same petals. For this post, I am going to use the Blazing Poppy and the Flowering Dogwood by Heartfelt Creations. 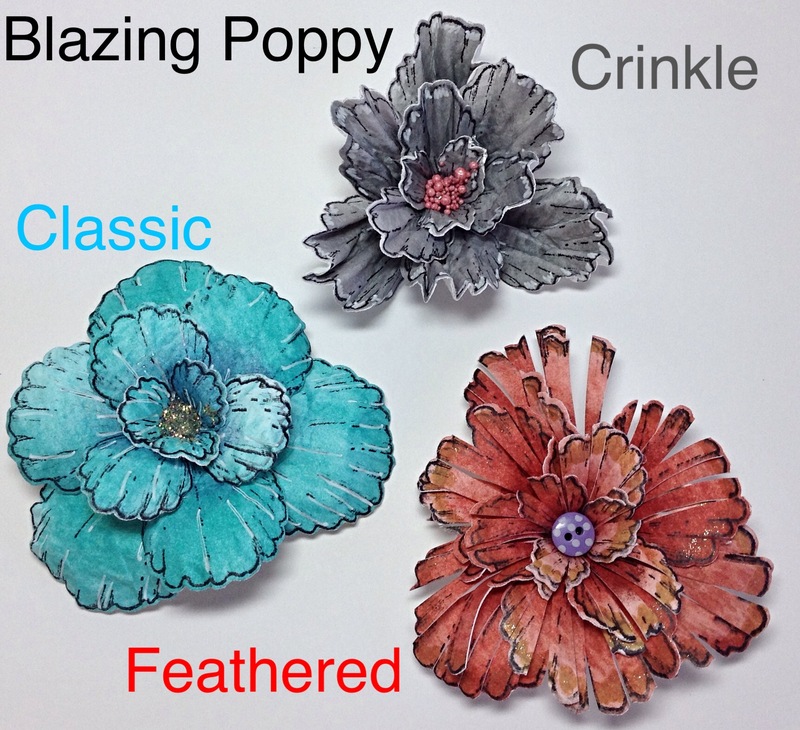 I did 3 different shapes of petals for the Blazing Poppy: Classic, Crinkle and Feathered. For the classic Poppy, I colored the petals with Ranger’s Peacock Feathers Distress ink. I accented the petals with a white gel pen. 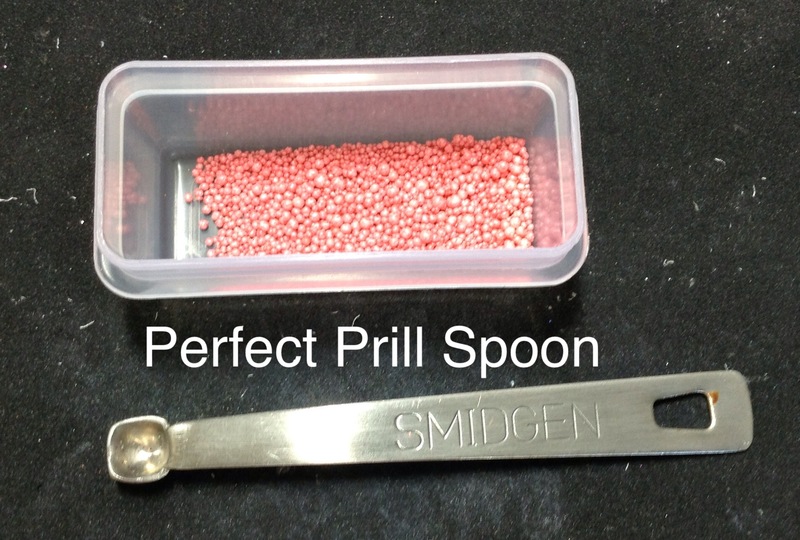 I shaped the petals using the 3mm, 5mm and 8mm tips from the Flower Shaping Tool Kit. The center is the Lion’s Mane Glitter by Heartfelt Creations. For the crinkled Poppy, I colored the petals with Ranger’s Hickory Smoke Distress ink. I accordion folded each petal and used some pink prills for the center. For the feathered Poppy, I colored the petals with Ranger’s Barn Door and Fired Brick Distress inks. I then cut each petal down the scallop to the edge of the center. 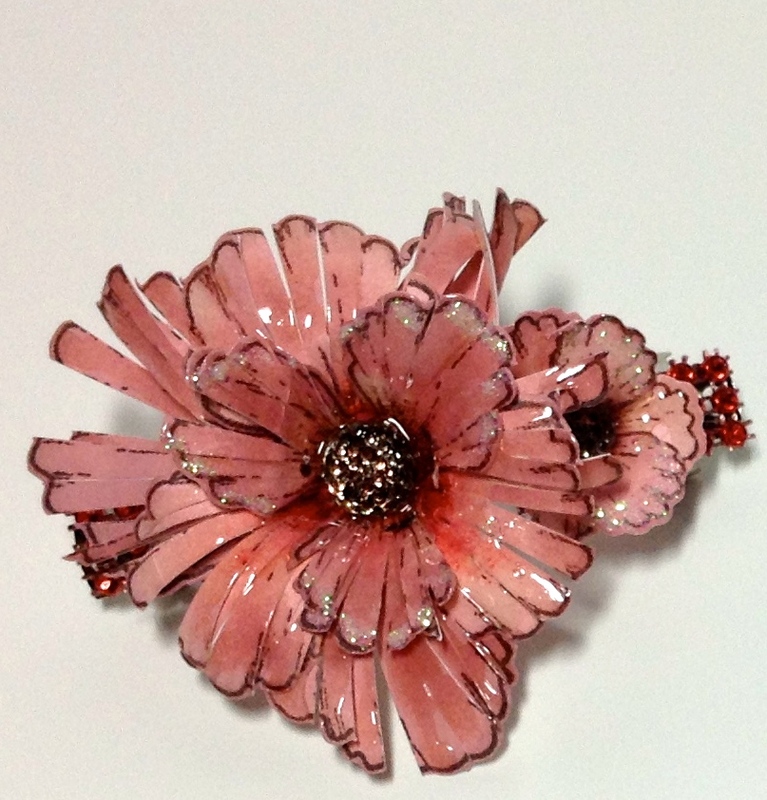 I used a 5mm and 8mm tip to shape the petals and centered the flower with a button. I made a barrette and sealed it with some glossy accents. 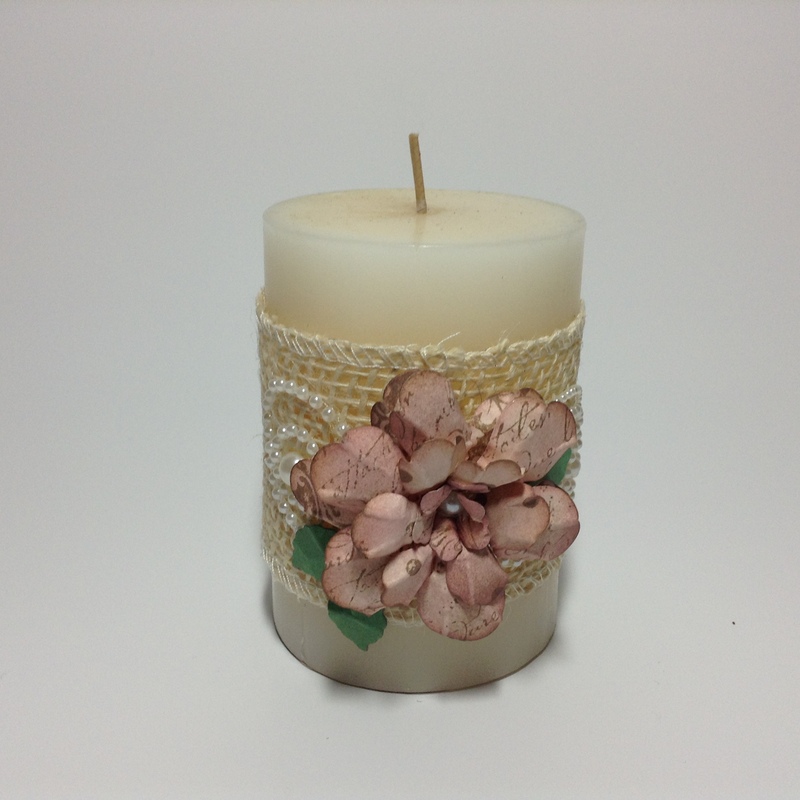 Decorate candles for gifts. With the Flowering Dogwood Collection, I stamped the images onto white card stock and vellum in various colors. I also made different flowers out of the Flowering Dogwood petals. Thanks for visiting and remember to share your passion with others.